Get the official FIFA world cup Adidas match ball with free shipping. 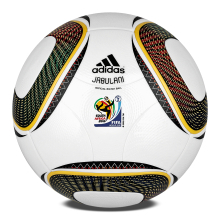 JABULANI, meaning “to celebrate” is the 11th adidas World Cup ball featuring 11 different colors representing the 11 players in every team, the 11 official languages of South Africa, and the 11 South African communities. The colorful design brings together the tremendous diversity of the country in harmonious unity. The match ball for the 2010 FIFA World Cup features a completely new, ground-breaking technology. Hand-stitched for big-time performance, these original and replique adidas World Cup 2010 soccer ball is FIFA tested and ready for inspired play.